A new group of seventh-graders from Thurston Middle School have agreed to carry on the work of Ten Boys Who Care, a club formed in 2013 to fundraise for scholarships to Laguna Beach High School athletes. From left, Noah Liao, Will Goodwin, Joseph Rosenberg, Shea Blanchard, Luke Meisberger, Taylor Towe, Jake Lund and Ben Neufeld, new recruits who will carry on the Ten Boys Who Care mission. The group recently gathered in Sam Reynolds’ backyard, the same spot where the original Ten Boys organized five years ago. “I told them this is a great opportunity to help their community. They have a chance to be part of a small group that has done some big things,” Mason Lebby, an original founder, said. 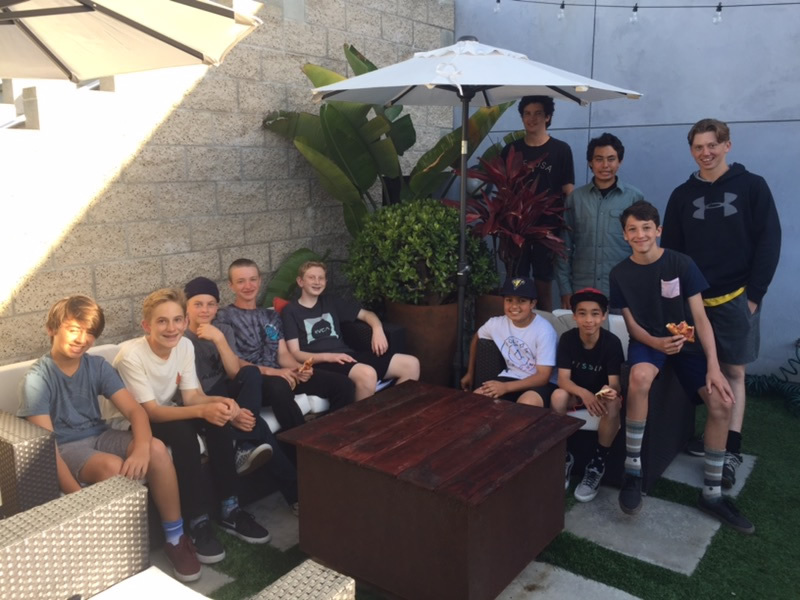 The younger boys listened to the presentation by the 11thgraders, played a little backyard spike ball, ate some pizza and went home to make their decisions. Agreeing to carry on the Ten Boys tradition are Noah Liao, Will Goodwin, Joseph Rosenberg, Shea Blanchard, Luke Meisberger, Taylor Towe, Jake Lund , Ben Neufeld, Griffin Naess and Oliver Rounaghi, says an announcement. In addition to Mason and Sam, the original Ten Boys include Kent Cebreros, Enzo Sadler, Gus Morck, Zack Bonnin, Sam Kluver, Noah Linder and Ayrton Garcia, who will graduate from LBHS in 2019. “It is great to see a group of young adults invest in serving others as well as modeling that character trait and passing it on to future high school students,” LBHS principal Jason Allemann said in a statement.